At Computex 2017, Intel introduced new connected home offerings that help make networks faster for high-quality experiences on every connected device and activity in the home – from virtual reality to immersive PC gaming, 4K streaming and more. 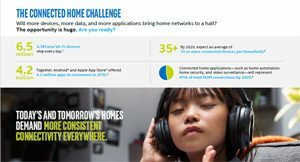 To extend connectivity to all corners of the home, Intel introduced the Intel® Home Wi-Fi Development Kit. Ecosystem providers can use this as they develop intelligent home networks that anticipate and adjust dynamically to deliver consistent connectivity to all connected devices, even as bandwidth demands increase. For fast connectivity within the home, Asus*, Deutsche Telekom*, Netgear* and Phicomm* are introducing new Intel®-based routers and gateways that can accommodate a growing number of connected devices in the home and still maintain high-speed connections. Intel and the Intel logo are trademarks of Intel Corporation or its subsidiaries in the United States and/or other countries.